The joint venture between KLM and Air France, Flying Blue, published changes to their award program going live on April 1st, 2018 (April fools to us?) that will fundamentally change how the program is run. Some of the major highlights is their change to revenue based earning, all seats being bookable with miles, and points plus cash bookings. Some of these new changes will open up availability for award flights to be booked. Previously they only opened up select award seats with limited availability for redemption options and dates. This new change allows for practically every seat to be booked with miles and will be based on the origin, destination, and date of flight. No more specific information is available to tell if the award flights will based on a clear price-per-point or something like Delta’s system where they hit a random number generator and that’s what the flight is worth. The next big change is the movement of their mile accumulation rules. The program will move to a revenue based system where the more you spend on your flight the more miles you will receive. Almost every US carrier has moved to this system and world wide carriers have begun to follow this trend. It almost seems like it’s turning into a video game. You’ll earn Miles for each €1 spent on flight tickets marketed as AIR FRANCE, KLM, JOONor HOP! (excl. government-imposed taxes and fees), including extra options such as more comfortable seating, extra baggage and “A la Carte” menus on board. Flying Blue will additionally be opening up the option to pay for your flights with miles and points together. With this new option you will be able to pay up to 25% of your flight with cash and use your miles to make up for the rest of your ticket. 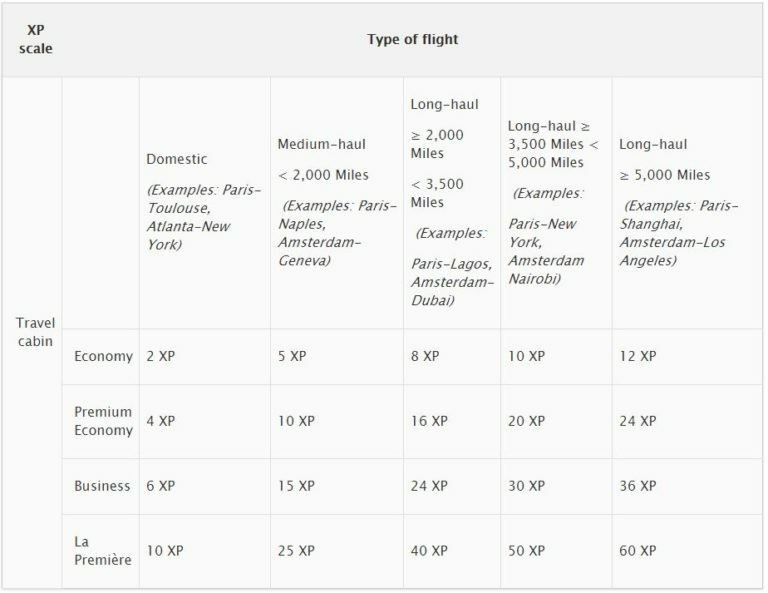 Generally if you want the highest redemption value miles and points gives you almost the maximum value for your flights. Your status with Flying Blue will depending on how many Experience Points (XP) you have with the program. At this point it sounds just like a typical video game, pay-to-win and you level up with experience points. You will gain these XPs depending on which fare class you’re booked into and will go towards your status with the airlines. You’ll keep your membership level or move on up to the next by gaining XP (Experience Points). The number of XP depends on your flight type and cabin class. The further you fly, and the higher your cabin class, the more XP you’ll get. By this time I hope you understand all the of the changes that are coming to the program. After looking over all the material I’m still a little at a loss on some information and I’ve read it over about a dozen times. But the basic information of the entire system is that you will earn miles based on how much you spend and based on how much you spend and how long your flight is you will get XP points that will translate into your status with the program. For simplicity sake consider the amount of money you spend as Qualification Dollars and consider your XP as Qualification Miles to translate it into more simpler terms.